I've been debating about the Clarisonic for a REALLY long time! There's a good deal on the Mia 2 today on QVC. I would really like to try it and see once and for all if it's as good as everyone says! If you're not familiar with this product... it basically claims to give your skin the most thorough cleansing possible. I have tried the Philosophy Purity cleanser that comes with this, and I know I like that! Plus I LOVE this cute black & white leopard print with the red button... it'd look great in our bathroom! I've gotten so many questions about the new "ready" shadows from Bare Minerals. Unlike the loose Bare Minerals shadows that have been around for years- these are pressed and I've heard rave reviews. 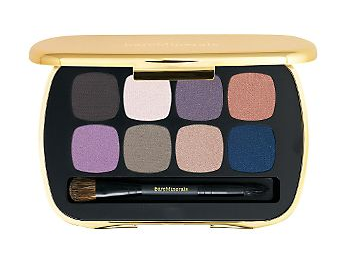 This 8-shadow palette on QVC called "Cocktail Hour" looks really pretty. I think it'd be a nice way to try a range of shades. After mentioning 2 items that would be brand new to me- I know these Philosophy lip shines are something I love. I remember years ago when my sister bought me Cinnamon Buns and I fell in love. Now Sephora is selling a 4-pack for $20- a great deal! The scents are all mouthwatering... Marshmallows for Toasting, Cinnamon Buns, Tinsel Town, and Peppermint Bark. 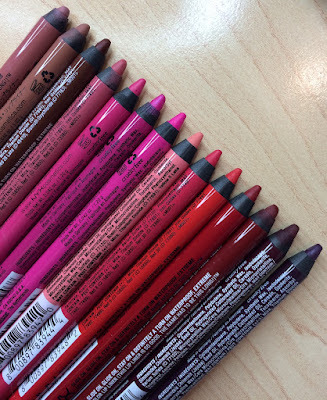 In my experience with these- the lip shines offer sheer color and lots of shine, but what's really outstanding are the realistic scents (much like their 3 in 1 shower gels). Shot, edited, and posted my Beauty Stocking Stuffers video today! I brought out my animated singing Christmas chipmunk and played it for Cupcake today. Her reaction was priceless! I must shoot a video showing this- it's hilarious! I bought the Clarisonic on QVC... I've been hearing such great things about it and thought it was too good of a deal to pass up!! :) I'm excited to try it! I just got that Bare Minerals pallet "Cocktail Hour" and I love it, I definetly recommend it! When I was visiting my grandparents for Thanksgiving, I heard your voice on TV! I was like- "Everyone be quiet! Is Emily Eddington your anchorwoman?!" It was exciting. Anyways, I love my Mia. I got it at Sephora, and it came with a slew of skincare products (Boscia, Dr. Dennis Gross, etc); the set is the same price as the brush itself normally is- $119. The only downside is you only get to pick from two colors. The products are really nice though. I think you should try the Olay Cleansing Brush. The head of the Olay brush rotates which I feel gives a better clean than just the vibrating head that the mia has. And the price tag is much smaller! I could not afford the Clarisonic - and still can't - but I bought a similar item from a friend who sells BeautiControl. It was only $12!!! (honestly don't remember if that involved any discount or not...don't think it did) I'm sure there are some differences (and it doesn't come in the pretty leopard print)-but if you just want to try it out, it's one way to go :o) I really like it - leaves my face soft and really smooth. ElvenEyes The Mia 2 has a timer that beeps & multiple speed options like the other models have. I think there might be a couple other new features but those are the biggest! Emily, I hope you get the Clarisonic for Christmas! I was incredibly skeptical but I could never be without mine now! You'll love it & the Bare Minerals shadows really are amazing! The Clarisonic is SO totally worth it. Read the science on it at their website. It's not just vibrating. My phd hubby has tried to explain it to me, but all I really know is that I've had WAY noticeably better skin since using my C, starting 3 years ago. It took me 2 months to see it, so be patient. We have 2 generations of the original, large size, but the technology should be the same, and Mias are so pretty. Splurge and treat yourself for Christmas. You'll be really pleased! I'm using Olay one and I love it. I've received the Clarisonic Pro from my hubby for Valentine's Day. I highly recommended this product to those who wear makeup and full coverage foundations on a daily basis. 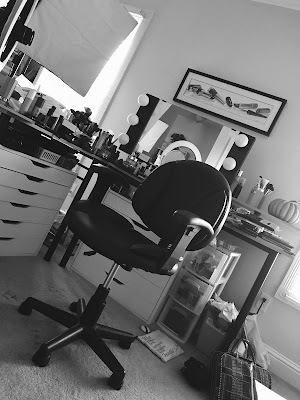 It helps to deep clean and remove makeup, allowing for skincare products like metrogel and retin-a to do their jobs. My hubby purchased the Pro model through a plastic surgeon's office. So True what the other poster said about needing something for exfoliation when using long wearing foundations. I think they put glue in them so they will stick! Combine that with powder and skin oils at the end of the day and I sometimes have to wash my face three times to get it all off! However, I have been using a buff puff (gentle version) for exfoliation and it gives me total control. I really like it and it removes everything. And they are cheap! Hah! 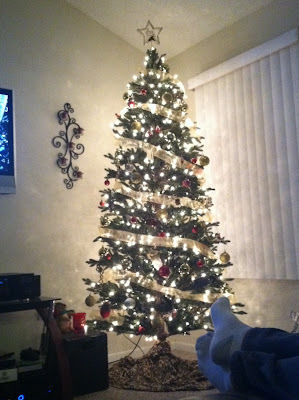 aawww your tree is so pretty :) i put up my mini one in my room but i don't have the big one up yet, i'm too busy! i love Christmas decorations as well. I wish you could do a house tour for Christmas again :) and i'm looking forward for your drugstore gift guide as well! I recently got a Clarisonic from amazon. I got the pink one with multiple speeds. I recommend getting this one vs. the original because it does such a better job. You can set it to be stronger or lighter. My skin has never looked better. I get acne and this has significantly reduced my breakouts. This is a product well worth the price. Hi Emily!! The tree looks so pretty. I been seeing some commercials for the Bare Minerals Ready Eye Shadows and I think I want to try some. I am still trying to figure out what I want for Christmas. It's funny because as a kid you want every toy in the world but as an adult you want very few things like family and security. Your tree is so beautiful!! I love the red and gold and the star on top is neat. I'm doing mine red and silver this year with a red star that lights up and red garland all around. It looks pretty awesome. Do you think you could do a blog on the Duraflame? I would love to hear how well it works. I love your videos!!! You are my inspiration! It would be lovely if you had a look. Please follow my blog if you like it! Save money and get an Oil of Olay spin brush instead. Just as good but definitely cheaper.